Cooking boneless chicken breasts is seen as one of the easiest bbq skills to master. But slow down there, my grilling friend. There are a few tips that will help turn you from BBQ fan to BBQ pro. Here’s how to grill chicken on a gas grill. Grilled chicken has long been a staple in our household. It’s my favorite meat to cook with by some way, with it taking centre place in some of my best BBQ recipes. My fondest memories of summer involve cooking up beautiful chicken breasts on our terrace. Don’t get me wrong, I still love grilled burgers and steaks, but neither come close to chicken for me. 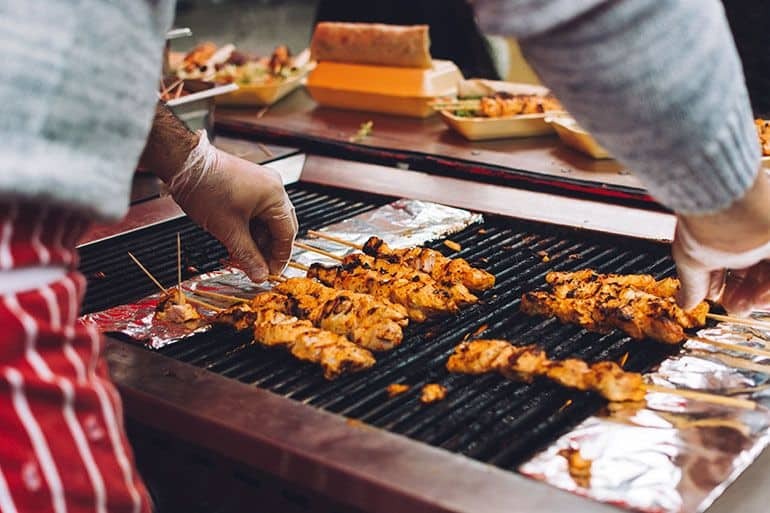 Whether it’s simple chicken burgers or elaborate kebabs, there’s a great grilled chicken recipe for any meat eater. But grilling chicken is something that isn’t as easy as it looks. They can dry out really quickly, which is enough to leave any BBQ party flat. Chicken can easily be cooked on a gas grill at 425°F/220°C. Just grill for 5 minutes on each side, or until the meat's internal temperature hits 165°F/75°C. 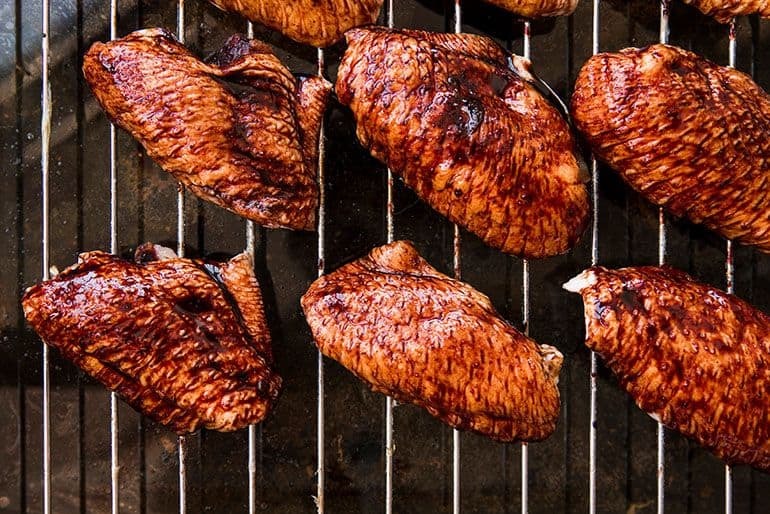 What’s the best grill temperature for chicken? How long does it take to grill chicken breast? What internal temperature is best for chicken breast? Why should we brine chicken before grilling? The secret to a perfectly grilled chicken doesn’t just lie in its time on the grill, but also the preparation time before. With pre-seasoning and brining as crucial a step as any. 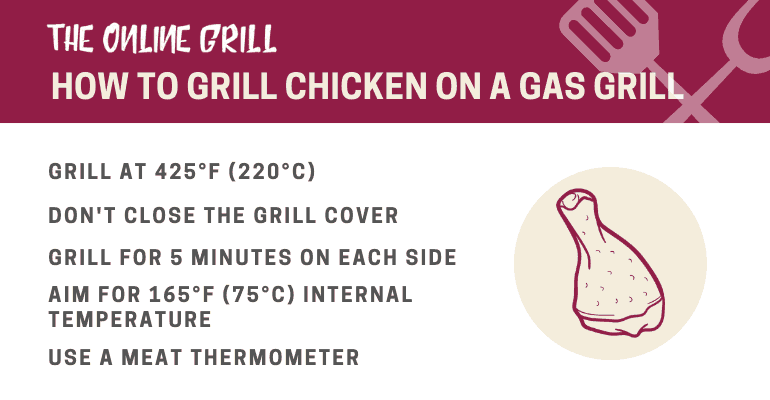 Here’s my step-by-step guide to show you how to grill chicken on a gas grill. While everyone has their favorite type of chicken cut – personally, I’m more of a wings fan (the cut, not the band) – today we’re specifically cooking with chicken breast. Chicken breast's boneless meat makes it easy to cook, and goes brilliantly either just as a side or as part of a burger. 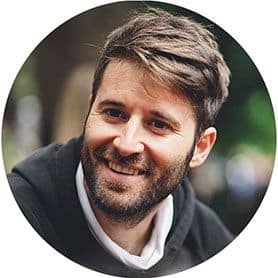 It is true that the larger the food, the longer it will take to cook, however I think that give so much more flexibility with what you actually use them for. When it comes to picking your breast, try to pick organic. Not only are there clear ethical reasons behind buying organic chicken meat, but organic meat also tends to be far superior in quality. Organic chicken meat often has a far better texture and quality of taste than non-organic varieties. Also try to buy skinless. 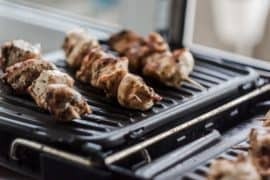 The meat in chicken breast is generally very lean, but the skin can contain layers of fat that can render and turn greasy when cooked on the grill. With a rolling pen or meat pounder, gently pound the chicken on a counter or table surface. Do this until they’re about half an inch thick across the breast. Do this for each breast. Why do we do this? Well like with a lot of cooking methods, one of grilling’s biggest challenges is cooking meat evenly through. If we make our meat uniform in thickness then we help prevent the issue, while also making it easier to eat and cut. Now to start the brine. This process will help keep the breasts moist and will enable them to beautifully caramelise on the grill. Add one part salt, one part sugar and eight parts water to a pan. Combine as best as possible. Remove the chicken from the plastic bags and carefully place in the pan. Transfer the pan to your refrigerator and leave for half an hour. Do not refrigerate for any longer than this. 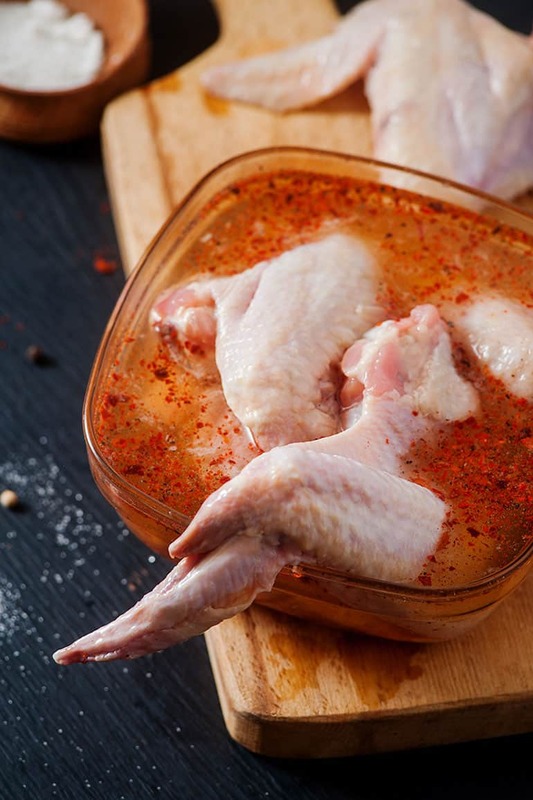 If you need a good brine, then check out the chicken wing brine recipe I use. I love barbecue rubs. I use them on almost every meat I make, and chicken is a meat that goes brilliantly with a good rub. Heat up your gas grill to a high heat. Personally I prefer around 425°F/220°C. This might take a little bit of time, depending on your grill. We want to create an environment where the breasts are being grilled quickly at a high heat, so ensure to let the grill warm up properly. 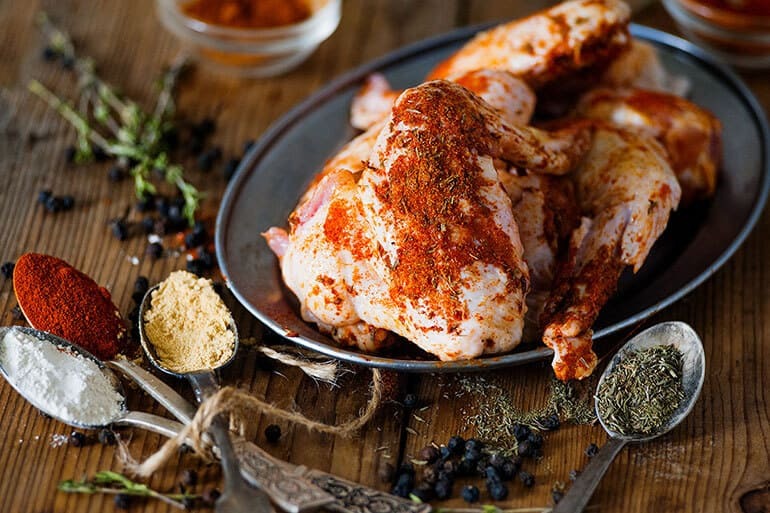 ​Take the chicken out of the fridge and dry off the brine using a paper towel. Pre-season them by brushing them with some olive oil, and sprinkling with salt. Place each breast on the grill, ensuring to leave a little bit of room between each one. 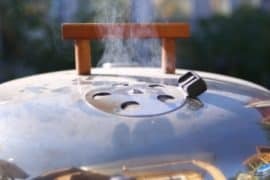 Do not close the grill, as we want to turn the breast frequently and control the grill temperature as best as possible. Grill at 425°F (or 220°C), grilling for about 5 minutes on each side. Turn the chicken often until we reach our target internal temperature of 165°F (75°C). I strongly recommend getting a meat thermometer to measure the internal temperature of the chicken. We want a medium-high heat so that we can give our chicken those unmistakable grill sears while still cooking it properly through. For me, 425°F/220°C does this perfectly. Always make sure that your chicken has been cooked properly though. The beauty of gas grilling is that it doesn’t take long at all. Usually it’s about 5 minutes per side, so 10 minutes in total. However I like to turn frequently (about every two minutes) to try and make sure that surface and internal temperatures stay fairly consistent. While cooking temperatures are a good guide, ultimately we need to be sure that the internal temperature of the meat is on target and safe. Once your meat has reached 165°F/75°C then it is done. Brining helps ensure that meat stays moist while exposed to high temperatures. This is particularly key in lean types of meat, like chicken, as their lack of fat content makes them prone to drying out. Luckily brines are very easy to make, very often only containing salt and water. The salt helps draw out the moisture before the meat then reabsorbs it. Do you have a different approach to grilling chicken? What’s your favorite grilling recipe? Let us know in the comments below!